The behavior of an UI is a complex state machine which should be tested. This can be done not only by automated UI-tests, but also with Unit Tests. It’s not easy to write Unit Tests for UIs, because you need to decouple the state of the UI from its declaration. One approach is the MVVM pattern. MVVM introduces a ViewModel layer that contains the state and behavior of an UI. The View only represents the ViewModel and reacts on its changes. Let’s try it. We want to build a login component which has two text fields (name/password) and a login button. The button should only be active when there is some text in the text fields. You can find the example on GitHub. Yea – we have a test, but the test won’t compile and pass, if we don’t provide a proper implementation. So lets implement the ViewModel. The userName and the password properties are representing the current input of upcoming text fields, so they are of the type StringProperty. The loginPossible property signals whether the user provided some input for the username and password field. It should be true, if both other properties have values. We can implement the View after the unit test for the ViewModel passed. I suggest to create a FXML-file by using the Scene Builder first. 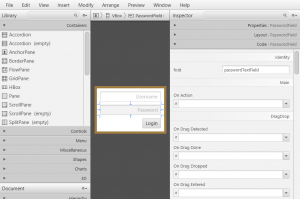 Now we create the JavaFX-Controller which is also part of the View layer in MVVM. You can view both files in the next code box by clicking on the tabs of the box. Let’s connect the View and the ViewModel by data binding, which ensures the propagation of changes in the properties. As we want the login button to be deactivated when there is no input in the text fields, we have to bind the disableProperty() of the login button to the isLoginPossibleProperty() in the ViewModel. 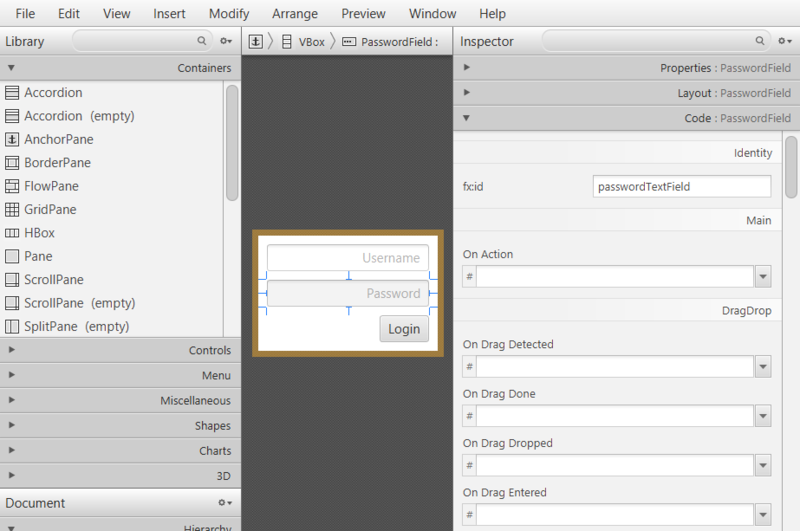 If the user enters a username or password the changes will be propagated by data binding from the View to the ViewModel. The ViewModel reevaluates the defined binding of the isLoginPossibleProperty(). A possible change of the isLoginPossibleProperty() will be propagated to the disabledProperty() of the loginButton . As you can see, we removed every logic from the view. The view is stupid and the behavior testable. The example can be found on GitHub. Thanks for this nice example of MVMM. How would you implement a more complex example in which the view contains a TreeView element that show elements of a more sophisticated model? Would the view know these model elements such that you would have something like TreeView in the view? Or would you use TreeView to keep the view free from any model references? This would result in some overhead when managing the items in the TreeView, I suppose. thanks for your response. I’m going to prepare another blog post regarding your question. First of all .. your listed Code and your uploaded one are different. The Action #onLoginButtonPressed in the LoginView.fxml is completely missing and if you would implement such an Action, you would have to place it into the LoginView.java.. this leads to controller logic in your View class. thanks for the hint. I hope the differences are not that big. No you don’t have to implement the action in the controller. You have several options to separate this from the view. I recommend you to read Microsoft’s documentation about MVVM to get an idea how to implement more complex hierarchies of views.